When you look at a satellite image, although you may not see it, every pixel in the image is subtly contaminated by the atmosphere. If you want to derive quantitative information or study evolutions through a series of satellite images, it is essential that the atmospheric disturbance is removed and the object surface reflectance is retrieved before any other analysis is made. iCOR does just that, and it is based on years of experience in the field at VITO Remote Sensing. 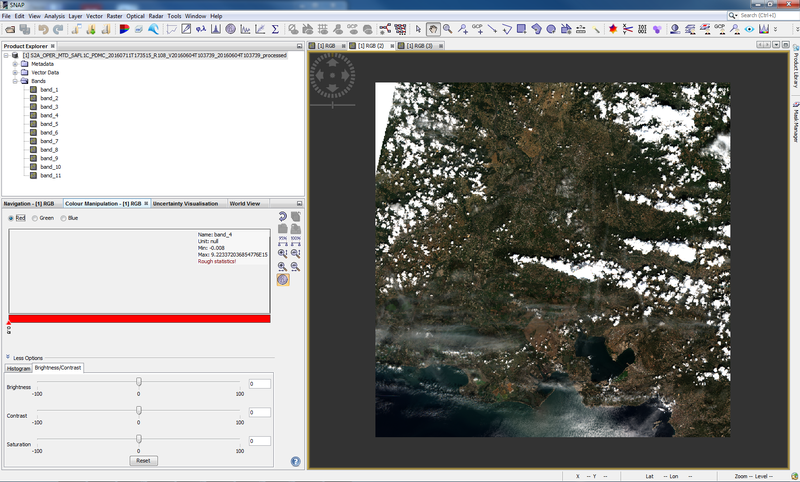 The atmospheric correction software, iCOR (previously known as OPERA), is now available to the broad user community through the ESA Sentinel Application Platform (SNAP) for the atmospheric correction of Sentinel-2 and Landsat-8 data. By implementing iCOR in SNAP, researchers can test iCOR for their own study areas and experiment with the different functionalities the new tool has to offer. The iCOR SNAP plug-in can be freely downloaded. iCOR has been extensively validated in different research projects (HIGHROC, INFORM and SPONGE) and within the ESA-NASA ACIX, Atmospheric Correction Inter-comparison Exercise (https://earth.esa.int/web/sppa/meetings-workshops/acix). It is important to keep improving our work on the atmospheric correction and expanding iCORs functionalities. Feedback from users is hereby invaluable so we encourage all iCOR user to send us feedback, comments, suggestions, wishes, etc. The strength of iCOR is that it is scene generic: it works just as well on land as on water targets (coastal, transitional and inland waters). The tool identifies whether a pixel is water or land and applies a dedicated correction. iCOR runs without user interaction and all the input parameters can be retrieved from the image itself. The extra module, SIMEC is part of iCOR and the SNAP implementation allows you to switch it on and off. In particular inland waters and estuaries can be severely affected by these effects and correction is strongly recommended. The iCOR implementation in SNAP corrects Sentinel-2 and Landsat-8 satellite imagery, and is easily configurable through the SNAP user interface. It works on Linux and Windows platforms alike. The development of iCOR started many years ago and was originally used to correct airborne hyperspectral imagery for atmospheric effects. We soon added an extra module, SIMEC (Similarity Environment Correction), because we experienced severe contamination of the water pixels by light coming from the surrounding land and vegetation. We extended the first features so that it would be possible to correct satellite imagery as well and made the tool fully operational without any need for user interaction. iCOR was tested and validated extensively for MERIS, Landsat-8, Sentinel-2 and PROBA-V. We use iCOR ourselves in several operational processing chains. The iCOR SNAP plug-in can be freely downloaded. After download and installation you can open it as a plugin in SNAP. The manual describes in detail the installation and handling of iCOR. iCOR was developed through funding from the Belgian Science Policy, The European Space Agency and the European Commission.